Ensure your spot today for the 2nd Annual Keys to Housing Resource Fair! 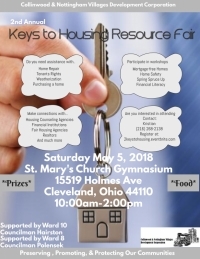 Organized by the Collinwood & Nottingham Villages Development Corporation, the Keys to Housing Resource Fair will feature information for first-time homebuyers, existing homeowners, tenants and landlords. CNVDC staff will be presenting informational workshops regarding, home safety, residential housing code, and how to purchase a home with our organization through our partnership with Cuyahoga County Landbank. Lastly, if you need help with financial literacy, this is the place to be! Shashonna Duckworth, Executive of Operation Hope will be presenting a workshop about financial literacy. Informational workshop slots are filling up quickly. You don’t want to miss out! 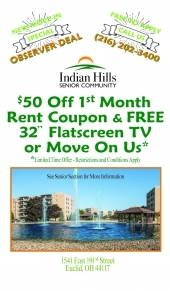 Residents who participate will have the chance to win prizes. Food and refreshments will be available. Also there will be a “kids table” available for parents who attend the event. 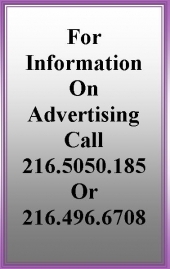 Location: St. Mary’s Church Gymnasium, 15519 Holmes Ave Cleveland, Ohio 44110.